Paignton Zoo in Devon has successfully bred two protected Mexican beaded lizards – a first for the environmental park – with zoo photographer Elliye Stobbart on hand to capture the incredible moment one egg hatched. This particular species of beaded lizard – also known as Heloderma horridum – is venomous and found mainly in Mexico and southern Guatemala. Heloderma means “studded skin”, which perfectly describes its dramatic black and yellow beaded body. 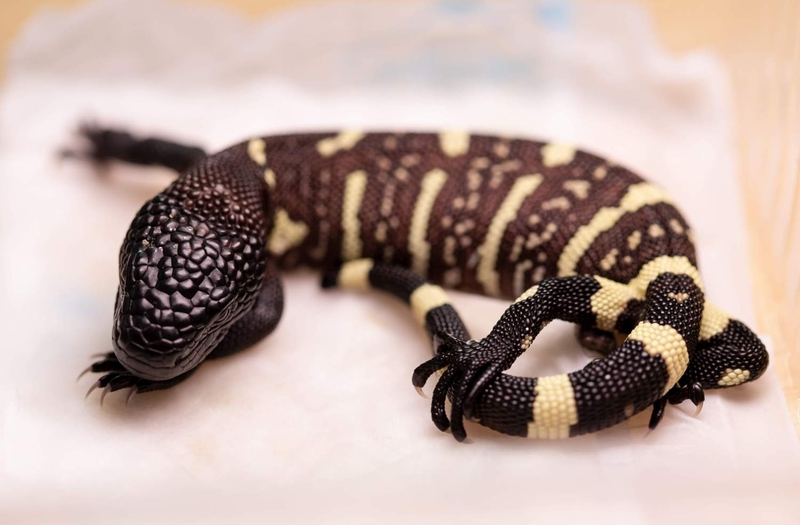 Adult beaded lizards can grow up to 91 centimetres (36 inches) in length and youngsters are rarely seen, spending their early years underground. Luke Harding, Paignton Zoo’s Curator of Lower Vertebrates and Invertebrates: “It’s a good to start 2019 with another breeding success. It’s testimony to the hard work of the Lower Vertebrates and Invertebrates department and all the support and investment from the Zoo that we are having such great success with our breeding programmes. “The commitment and expertise of the staff cannot be praised enough and all their hard work is paying off with fantastic results such as the hatching of these lizards. It is an exciting time to be part of a fantastic team of keepers at such a forward thinking organisation and I hope many more successes will come in 2019”.